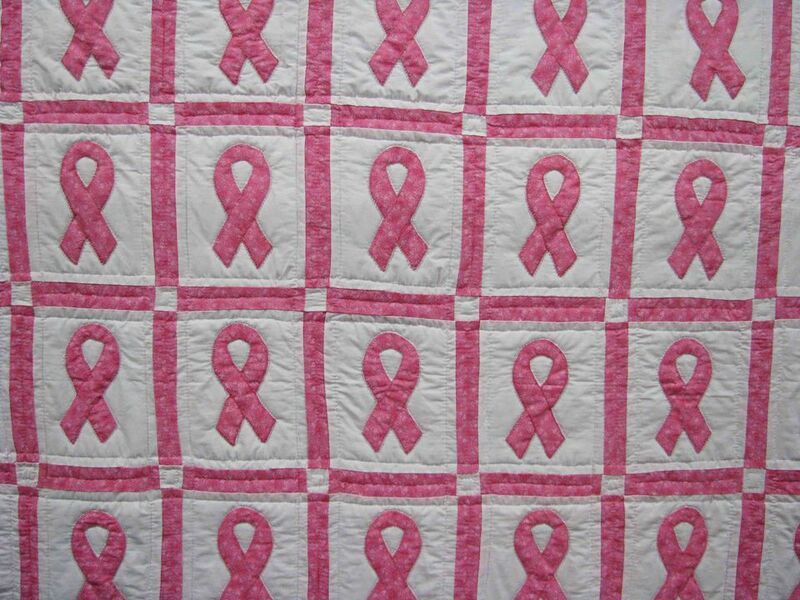 This version of the Awareness Ribbon quilt block is foundation pieced. If that method is new to you, be sure to read foundation piecing basics, and perhaps make a sample Log Cabin block before you begin. Foundation templates are a mirror image of the actual quilt block. For this block, you'll sew mostly long triangles (cut from bars) and long strips of fabric. Download the file here. 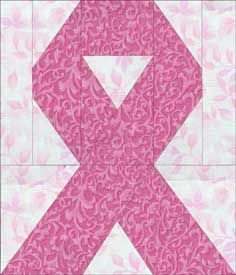 The file contains templates for two ribbon block sizes, 6" x 7" and 3" x 4" (finished); instructions are for the larger block. Most bias edges are positioned on the interior of the block, where they're stabilized by other patches. Cut only enough fabric for one ribbon block. Everyone foundation pieces a little differently (primarily due to more or less overlap when sewing seams); adjust patch size up or down after you've made a sample. Sizes are approximate; use scraps if you like. Read Foundation Piecing Basics if this technique is new to you. Make a foundation using the top half of the block in my PDF file. Be sure to print the templates at 100-percent. (They can be scaled up or down, but if you do that, remove the outer seam allowance and redraw it to equal 1/4"; adjust patch dimensions to reflect the new block size.). Place the background piece reserved for patch 1 right side up on the foundation, centering it within the printed boundaries of that patch. (The illustration shows the fabric as opaque so that you can see lines). Hold the fabrics in place (pin if you like) and flip the foundation over. Sew a seam on the line that separates patch 1 from patch 2, beginning and ending it a few stitches on either side of the line. Flip the pink strip you just sewed right side up. It should cover patch 2 underneath, with enough of an overlap along the three unsewn sides to create a stable seam when those seams are sewn. It will stretch past the right side of patch 2 -- the excess can be trimmed later. After trimming the allowance, flip patch 2 right side up again and finger press. Position a patch 3 triangle (one of the pair won't work -- make sure the shape aligns with patch 3 before sewing) right side down along the line that separates patches 1 and 2 from patch 3, overlapping the line enough to create a stable seam allowance. Holding fabrics in place, turn the unit over and sew on that line, beginning and ending a few stitches on either side of it. Flip the new piece right side up and check placement. Its edges should cover the area of piece 3, with enough overlap to create stable seam allowances when lines around it are sewn. Its bottom edge should extend past the outermost line of the template (the trim line). If all's well, flip the piece wrong side up again and trim through all layers underneath it, leaving an approximate 1/4" seam allowance. Flip right side up and finger press in place. Position pink patch 4 right side down with its top edge centered on and overlapping the foundation line that defines the top edge of patch 1 (not shown). Sew, check placement, trim through all seam allowance layers to even the up and reduce bulk, flip upright and finger press. Sew a pink strip onto the foundation, for the patch 5 area, by aligning it right side down with its right edge overlapping the patch's left line by about 1/4". The top and bottom of the strip should extend slightly past the outermost foundation lines on the top and bottom. Sew, check placement, trim through all seam allowance layers, flip upright and finger press. Note: some patches are shown lighter and/or opaque so that you can see the lines underneath. Colors don't truly differ. Use the same techniques to continue adding patches in numerical order. Take care with the long triangles -- it can be a little tricky to position them correctly, but once you "get it," you'll be fine. Remember that the edges of all patches along the outer edges should extend past the outermost foundation line (the trim line). Press when you're finished. Trim through all layers on the outermost foundation line at the bottom of the design. The bottom half of the ribbon block is assembled in the same way as the first, in numerical order. Start with patch 1, placing it right side up. Align and sew the two patches next to it before moving on to patches on the opposite side of the unit. Always remember to trim back seam allowances as you go (all layers) or you'll have a jumbled mess of fabric on the back of your quilt block. Press the unit and trim on the outermost foundation line at the top of the design. Align the two block halves right sides together and sew a seam along the line at the midpoint, where the trimmed edges meet. Press and trim along all outer lines (lines should match where the halves were sewn together). Leave foundations in place until the block is sewn to sashing, a setting rectangle or to another block. Some long triangles weren't used. Save them for another project or make a mirror image quilt block.